In the race to complete projects, time is prime in precision delivery and placement of bulky and weighty materials. Nothing handles these tasks like heavy lift helicopters, especially in Idaho, which leads the US in economic growth. Idaho is characterized as intense clusters of activity separated by long distances. This is so along the Snake River Plain as Boise and other cities expand, and also in the Rockies to the north. Heavy lift helicopters are strategic to all of these areas. FairLifts contributes by booking copters, crews and rigging for helicopter lifts. In addition, FairLifts considers appropriateness of existing rigging and relevant crew experience. are used when heavy materials can be loaded inside a helicopter that has been configured to carry cargo. are used when the load is too bulky to fit inside the helicopter. Special rigging is used to attach the load below the aircraft. Most external helicopter lifts involve a crew of two to four people: a certified pilot, an on-board spotter, and one or two people to guide the cargo at the delivery site. In addition to offering the ultimate in maneuverability, lift helicopters can travel at up to 100 mph or more from the staging to drop-off areas, saving time and money. This combination of versatility, maneuverability, precision and speed means that lifting copters are best for a wide range of lift services in Idaho, including those listed below. Towers are becoming part of the landscape in Idaho, just as in the rest of the country. Installing this infrastructure and keeping it in proper working order is a top priority. FairLifts can arrange for the helicopters that make the task more efficient. We’ve all seen those very tall signs advertising to the Interstate. In many cases, the way they got so high is because a lifting helicopter put them there. While advertising may be an art, helicopter pole and sign placement is a science, one where FairLifts can help. There are plenty of remote, hard-to-reach areas in Idaho, and there are even more when winter sets in. They include the Bitterroot, Clearwaters, Lost River, Salmon River, Sawtooth and White Cloud ranges of the Rockies. FairLifts books the helicopter services that can get you there. The Construction industry crosses over most others, and uses helicopters in many areas. Whether it’s ski lift components, high-altitude construction materials, irrigation pipe, a silo or some prefab trusses, count on FairLifts to help you get what you need, where and when you need it. 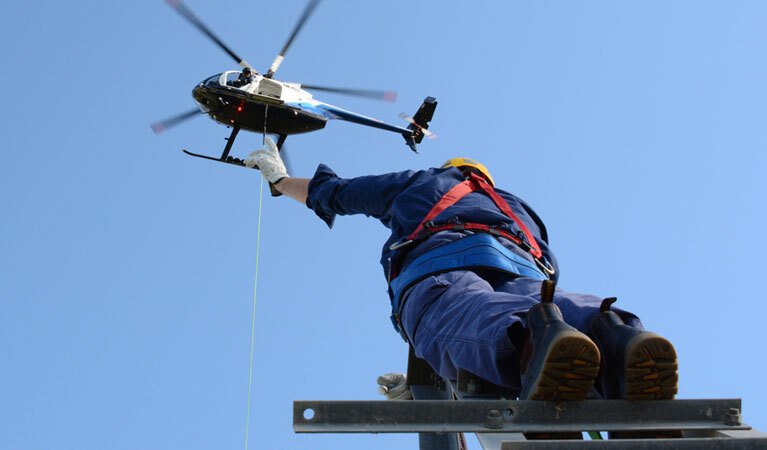 There’s no predicting when you’ll need helicopter lift services. Even when they are part of your plan, things happen to disrupt your schedule. That’s why our support is 24/7.